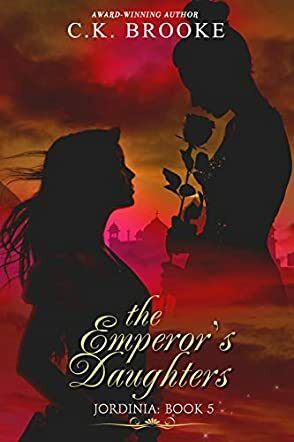 The Emperor's Daughters - Jordinia: Book 5 by C.K. Brooke is the story about two duchesses: Raphaela and Benedicta. Both the duchesses have a different outlook towards marriage. While Benedicta is quite optimistic about the idea and has several suitors eager to marry her, Raphaela wants nothing to do with marriage and wishes to travel the world. However, a turn of events flips their mindsets for better or for worse. When Raphaela receives an invitation from Al Habar to attend the Summit of Nation Falls, she immediately considers it her first step towards becoming a diplomat. She pleads for her parents' permission and gets them on board with her wish to represent Jordinia in the Summit. What none of them could have known was that there has been a grave misunderstanding in reading the message of Al-Habar. As for Benedicta, she is certain that she wishes to be somebody's wife and bear his children, but she does not want to get married without having a story. She does not want to look back and regret not doing anything before settling down. So, when the opportunity to help rebuild a flood affected area knocks at her door, she grabs it with both hands. In her efforts to rebuild this place, she will rebuild her own personality and defend her choices. The execution of The Emperor's Daughters is perfection. The story will bewitch you and, before you realize it, you will be deep in its plot and unable to put the book down before reaching the end. The story seemed absolutely predictable: Raphaela would travel the world and remain a spinster, while Benedicta would find her perfect man. However, the author added twists that quickly converted the plot from "predictable" to intriguing. The plot took many delightful shapes throughout to the end. Each character has a dynamic personality. The sweet and innocent Benedicta has the capability to show her feistiness when the plot demands; along similar lines, the rebellious and outspoken Raphaela has a romantic side to her that she doesn't hide from the world. There are bad people in the plot and their evil side is defined without holding back. I would recommend this book to readers who like a good romantic fiction about dukes and duchesses and who are impressed by an author's ability to portray royal families as normal people. The transformation of Benedicta and Raphaela from two royals to two amazing women is definitely a delightful read.